Founded in 1988 with the purpose of helping insurance marketers and companies communicate with and recruit more agents, Agent Media is now the leading provider of database and marketing solutions serving the life, health, and annuity segments of the insurance industry. Today, the database has grown to 1.7 million producers, representing nearly every licensed agent and registered representative in the U.S. Along with its extensive database, the company has developed a collection of integrated media tools, including the Agent’s Sales Journal, the Agent’s Market Pack, Insurance Marketing magazine, Target Agent Lists, ProducerDirect, eProducer Connect, and more. 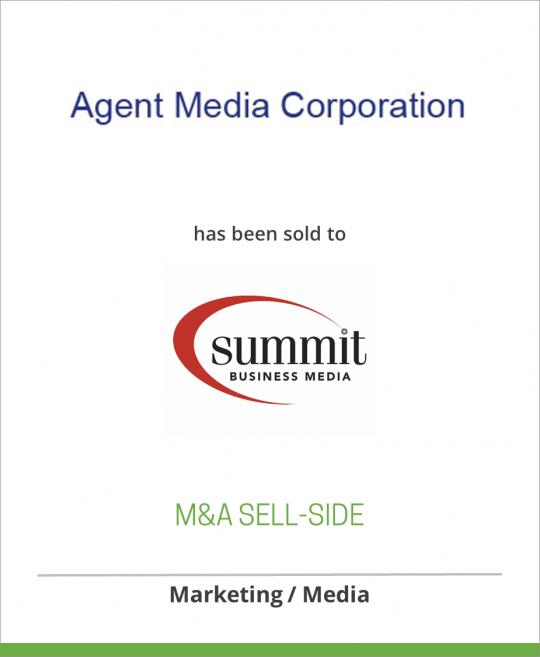 Summit Business Media was recently formed through Wind Point Partners_ acquisition of Highline Media and Pfingsten Publishing, in November 2006. In addition to the SB Media LLC business, Summit Business Media’s Highline unit also serves the insurance community with the National Underwriter Property/Casualty and Life/Health weeklies and four other insurance focused-titles; the financial industry via Wealth Manager, Research and Futures magazines; the reference tools TaxFacts and Fire, Casualty and Surety Bulletins, along with 150 other books, electronic products and conference events. It is also the leading data provider of financial and market information on insurance companies. Additional information about Summit is available at www.summitbusinessmedia.com. Additional information about Highline Media is available at www.highlinemedia.com.